Our customer is a manufacturer of parts and components for the Telecommunications Industry and has been in business for 75+ years. They designed a unique family of parts for one of their clients but then discovered that the parts were unable to be manufactured on commercially available equipment. The design was perfect and the specifications were unchangeable. Their client needed the part produced in increasing quantities over time. Commercial equipment did not exist to manufacture their own design, and they needed a production partner with the ability to design, build and operate such equipment. The customer had immediate small volume production needs that dictated the use of manual processing. Our customer forecasted an increase in volumes which dictated the need to address the long term costs of manual production and demanded the development of full automation. 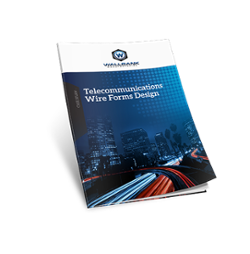 Complete the form on the right to download your copy of “Telecommunications Wire Forms Design Case Study” to find out how Wallbank was able to support their customer’s increased capacity at a reduced price.